Sharing your handwriting with others is a way of sharing part of yourself. When I read that sentence—written by Gina Logue, a columnist with The Murfreesboro Post, in a piece today on Tennessee’s return to teaching cursive handwriting to grade-schoolers—I found myself smiling in agreement. No keyboarded words will ever compare to those applied with pen to paper. My mother died eight years ago, but whenever I come across her handwritten words on a note or an envelope or the back of an old photo, her face springs at once to mind. How instantly we recognize the penmanship of a loved one, its size and slant, those familiar quirks and curls. And without even thinking we catch more subtle signs that add depth and context to the message. The pressure of the pen. A hurried look. Unusual neatness. A pause to reflect. Handwritten words, transcending time, move directly from mind to pen to mind. This idea got me thinking of the many penned words left us by Frederick Douglass, the nineteenth-century American abolitionist and orator. I modeled a font after Douglass’s compact, legible script—Douglass Pen, it’s called—and in the process, more than a century on, he managed to change my mind. Specifically, Douglass changed my mind about John Brown. From what I’d learned in school in the 1960s, Brown’s 1859 raid on Harper’s Ferry was the equivalent of domestic terrorism. That his abolitionists crept in by night and killed innocent people in a crazy scheme that was sure to fail. That Brown himself was a wild-eyed crazy man. But when I read, in his handwritten words, what Douglass had argued so eloquently—that Brown, whom he knew, was an idealistic hero who gave his life for the cause of freedom—I began to research further. Turns out Henry David Thoreau, too, knew and supported Brown. And most modern historians are gentler on his reputation than those of the twentieth century. Most credit his Harper’s Ferry raid with hastening civil war and the death of slavery—his mission all along. 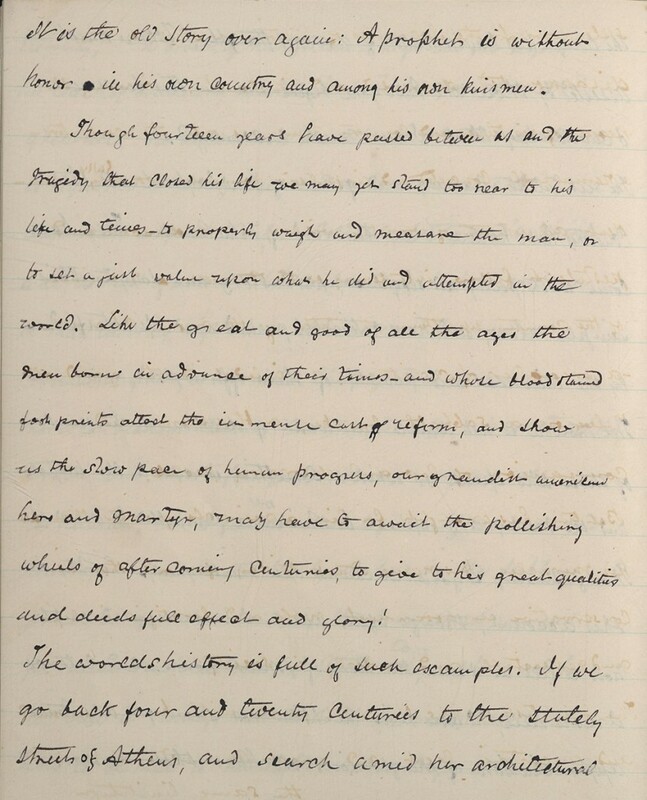 Still, it was Douglass’s neat, true penmanship in a draft of a Harper’s Ferry lecture that proved, to me, most convincing. Though fourteen years have passed between us and the tragedy that closed his life, we may yet stand too near to his life and times—to properly weigh and measure the man, or to set a just value upon what he did and attempted in the world. Like the great and good of all the ages the men born in advance of their times—and whose blood stained footprints attest the immense cost of reform, and show us the slow pace of human progress, our grandest American hero and martyr, may have to await the pollishing [sic] wheels of after coming centuries, to give to his great qualities and deeds full effect and glory! 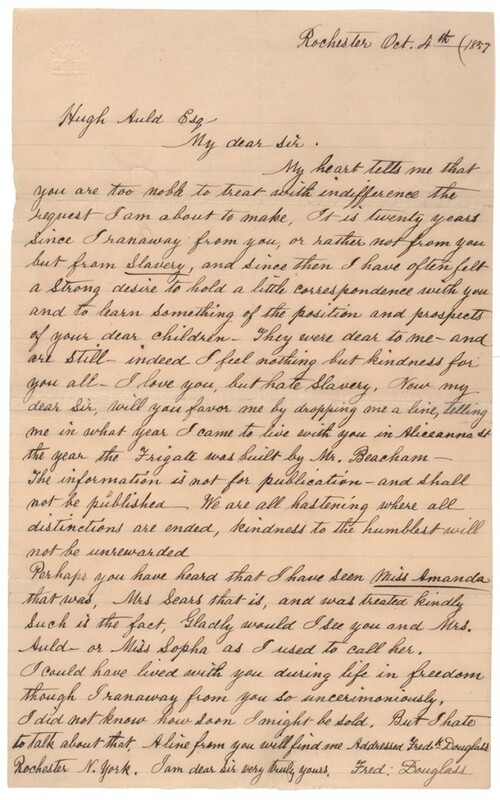 Douglass letter to Zion Church. 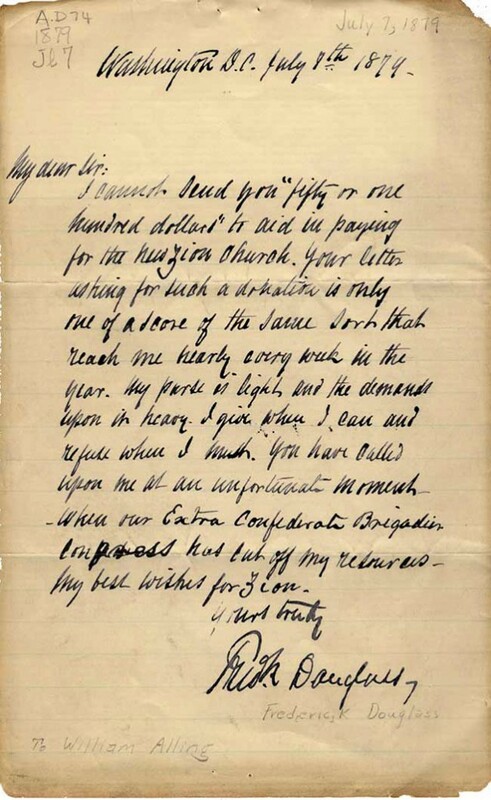 And another note, a reply to a letter asking for money to help build a church, includes pithy sentences that communicate a lot. “My purse is light,” he wrote, “and the demands upon it heavy. I give when I can and refuse when I must.” The man had a classic orator’s way with words. 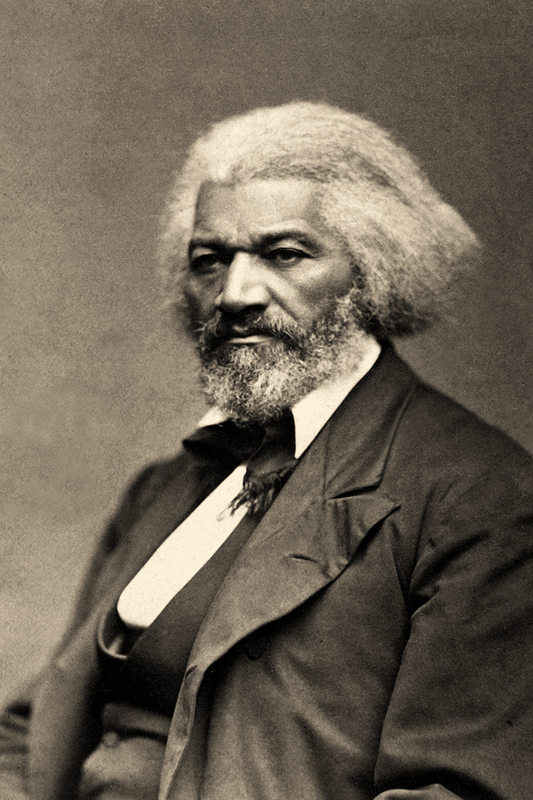 In working so many long hours recreating Douglass’s penmanship, I’ve come to be able to recognize his hand. As I do my parents’—or past loves who broke my heart. A lot more gets said through handwriting than merely words. You are currently browsing the The Antique Penman blog archives for September, 2014.